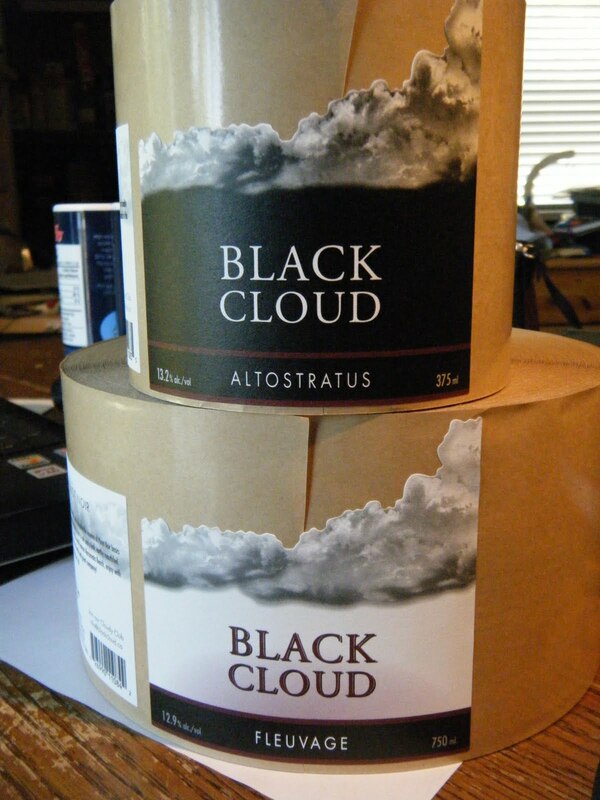 Black Cloud - Unmatched Pinot Noir: Vineyard Obstacles or Challenges? The rush to create vineyards and wineries in British Columbia has led to some polarized dialogue over the subject of suitable places to create wine. Recent arrivals to the industry see no problem developing vineyards in locations that the previous wave of vignerons would have rejected outright. Why the change? How do unsuitable locations suddenly become prime grape growing areas? Part of the answer lies in economics. If a bottle of wine can sell for three times the price it was selling for only a few short years before then there is an impetus on the producer to pull out all the stops in an effort to create that wine. I'm often asked by prospective winery owners and investors whether this portion of land or that one will be good for grapes. While I am flattered that they would ask my opinion, it's prudent to remind them that I'm not a viticulturist or a biologist or a geologist; all specializations that are valuable in choosing sites. In my short time in the business I have learned a couple things. With that disclaimer I do offer up this: growing grapes on a commercial scale is all about minimizing and maximizing what had been dealt. Once the decision is made to obtain land and develop a vineyard, it's important to minimize the challenges that the environment presents. It's just as important to maximize the advantages that the prospective vineyard demonstrates. Besides the obvious things like soil and sun there are other aspects like access and curb appeal that may influence production. These are economic factors that may ultimately effect the performance of the vineyard. A while ago I heard an Okanagan grower remark, "I don't know where these new guys (wineries) are going to get their grapes; all the good land is gone." . In a conventional sense he may be close to the truth. Common practice and history are factors that define what a vineyard looks like. Under those old parameters, a lot of vineyard property is in short supply. What new developers are beginning to see is that marginal properties are the key to new vineyards. Marginal land can simply be described as second choice land. Something makes it less attractive and presents a challenge to the grower or the wallet when it comes to developing it as a vineyard. The trick is to see where the challenge can be met and have a vision for the outcome. A few years ago I was told by a friend in California that a friend of his who lived in Napa was approached by a winery to plant grapes in his front yard. It was a nice property but only about 100 feet deep in the front and 70' wide. Hardly a prospective vineyard in the normal sense. So what prompted the offer? Was he adjacent to a stellar vineyards? Was it close to the winery's front door? The reason was the appellation or geographical indicator. Simply being in Napa allowed the value of these grapes to be far greater than similar grapes grown in another county. The Napa brand has soared to such heights as to allow mini-vineyards and such to be feasible. This, in a diluted form, is what is happening in the Okanagan and, to a lesser extent, the rest of B.C. Next time somebody says you can't grow grapes in THAT location, ask about the hurdles in the path of that goal and determine what can be overcome and what can be emphasised. Too much water? Create better drainage, enhance the soil change the aspect, modify your root stock. Land slopes north? Change it with earth movers. Pick your varietal, modify the trellis. Those are just a few examples. Developments in land management over the past 30 or 40 years have allowed marginal lands to become prime. Add to that the prospect of climate change and the expansion of BC vineyard operations looks to continue for some time.